Welcome to the Optimum G2.6 Advanced - : Our Best Commercial Blender Currently Used By All The Range Department Stores Cafes Across the UK... Sleek, sophisticated and so very practical the Optimum G2.6 Advanced- Platinum Series blender is the most advanced blender within the Optimum range of appliances. 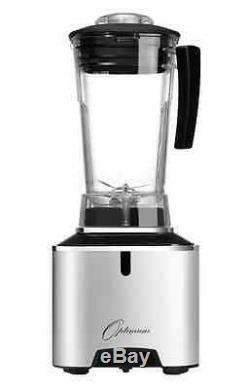 The latest in blender technology and style with the most powerful motor at 2400W blending your needs at perfection. JUICE / SORBET / GRIND / NUT MILK / SOUP / SAUCES. Sleek, sophisticated and so very practical the Optimum G2.6 - Platinum Series blender is the most advanced blender within the Optimum range of appliances. Black and Silver are available - p. Lease tell us which colour you would like in the comment section in your order. Featuring an elegantly simple LED touchscreen panel. Six automatic, one-push automatic programmes. UL, CE and FDA approved Eastman Copolyester BPA Free jug with lid and cap. Wet and dry multi-purpose 6-blade stainless steel assembly. Heavy duty tamper tool for improved processing and mixing. FREE 104-page comprehensive hard-copy recipe book. Access to expert support team. Fruit smoothies The Optimum is designed to make the best fruit smoothies in both domestic and commercial environments, crushing ice and fruits in seconds. Green smoothies Kale, lettuce, celery, spinach, mints, cucumber, bananas or carrots, the Optimum will make sure your green smoothie is smooth and not fibrous. Grinding nuts and grains The Optimum's 6-Blade assembly allows it to easily grind whole grains, beans, rice and kneading bread dough ready for the oven. Crushes Ice The commercial-grade 3 Horse Power motor allows the Optimum to crush large quantities of ice in seconds, perfect for smoothies, slushies and ice cream. Nut butters Chocolate Hazelnut, Peanut Butter, Almond Butter... The Optimum will make the most delicious preservative-free nut butters, using only one ingredient. Nut milks Mix the nuts with some water, blend, filter, and serve for a natural dairy-free bowl of milk and cereal. Ice cream from frozen fruits The Optimum turns your favourite fruits into a fat free, preservative free, beautiful guilt-free bowl of ice cream. Hot Soups The same blender which can make frozen ice cream can also make steaming-hot soups from all natural ingredients in less than 10 minutes! This is achieved with the Optimum's incredible speed of 48,000 rpm, allowing the blender to heat the contents through friction heat. Spreads and dips Whether you prefer a silky-smooth hummus dip or a chunky tomato salsa, the Optimum is here to help, offering you a range of dips and spreads to choose from. Fresh Fruit Juices The Optimum is able to easily blend whole fruits and vegetables, unpeeled and uncut, creating a healthy juice full of fibre. Nothing is wasted, so cleaning is quick and easy. Cocktails Cocktails can be prepared shaken, stirred or blended with ice for a frozen treat in seconds. Omelettes The same way the Optimum can make a steaming hot soup, the friction of the blades can also cook beautiful omelettes in minutes! 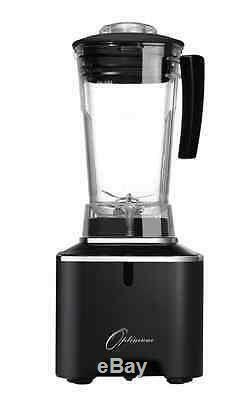 The Optimum G2.1 is a durable high speed blender for usage domestically or commercially due to. Its efficient and durable proprietary Carbon Brush Motor: The Optimum's powerful motor varies electricity consumption based on the power required. This allows the blender to outlast most competition with no breakdowns or hassles along the way. Its stainless Steel 6-blade assembly: Equipped with 6 blades, the Optimum can pulverize the thickest ingredients with no hassles and no struggle. Its Intelligent Overload Protection: For extra durability, The Optimum has a built in sensor which automatically switches off the motor when excess usage leading to over heating is detected, prolonging the Optimum's operating life while pre-empting and avoiding breakdowns. If the blender should ever trip - simply switch it back on. Our supplier, Optimum Appliances, is an Australian-owned company who've built their reputation by developing world-class products, which are then distributed across the globe exclusively via Froothie. Theyve earned that reputation in part due to the time invested to research customers needs and then do whatever possible to achieve a high quality end result. For example, we asked our busiest, most discerning clients what they really needed from their blenders. They told us they wanted an intelligent appliance that created smoothies, soups, and other fresh, healthy foods as quickly and simply as possible. Just as importantly, however, they didnt want all that intelligence to come at the expense of elegance. Welcome to the Optimum G2.1 - Platinum Series Blender: smart, versatile functionality at the push of a button all in a stunningly stylish exterior package. 2 Peak HP Base Motor. Eastman Tritan Copolyester BPA Free. The benefits of being a Froothie customer extend well after you order your Optimum G2.1 - Platinum Series blender. While your new blender offers simplicity at the touch of a button, therell always be more you can do with it, so youll want ongoing guidance and support to get the most from it. Thats why we ensure that our support team are there for you if you need them. If youre not satisfied with your new blender for ANY reason, contact Froothie within the 30 day period. Six automatic, one-push button programmes offering the ability to create perfect smoothies, sorbets, nut milks, soups, sauces, or ground nuts and coffee. Precise, fine-tuned manual control: offering the ability to set the time and speed to the exact parameters you desire, or pulse first for increased smoothness. Wet and dry multi-purpose jug, includes cap and lid Heat-Resistant Polycarbonate 2Lt Jug. The innovative design makes cleaning your Optimum G21 - Platinum Series blender easy there is no need to remove the blades! Heavy duty tamper, nut milk cloth. 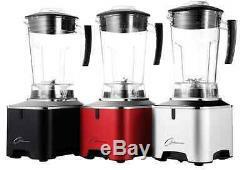 The item "Best Commercial Blender Optimum G2.6 Most advanced Smoothie Maker, Crush Ice" is in sale since Wednesday, March 2, 2016. This item is in the category "Home, Furniture & DIY\Appliances\Small Kitchen Appliances\Table Top Blenders". The seller is "blenderpeople" and is located in Bristol. This item can be shipped to United Kingdom.